We arrived in Salvador late in the evening, and from what we had heard and read we had prepared ourselves for the inevitable mugging the second we stepped off the coach. Somewhat perplexed we had managed to rescue our luggage and had all personal belongings in tact, we decided to aid the upcoming theivery by piling in to an unlicenced taxi and heading for a hostel in a dodgy part of town. After arriving and settling in to our hostel, which had echoes of strangeways about the bedrooms, piled as we were in triple decker bunks. Thankfully the check-in lottery had worked in my favour this time and I wasn´t made to sleep up with the Gods. Mel and Vicci were not so lucky, I did not snigger once, honest! We decided to take a wander round the streets and find some dinner, but the area round the hostel (in the historic centre) felt quite imposing and unsafe. We did seem to attract quite a lot of attention from the kids begging on the streets and the local men. After dinner we went back to bed wondering what on earth we were doing there. Overnight something magic happened and we woke up to bright sunshine, a lovely breakfast and, when we ventured outside, some really lovely buildings and stalls and women wandering around in traditional Bahian costume and the now obligatory bunch of men practising Capoeira in the streets. We spent the day wandering round the markets, buying too much jewelery and eating amazing food at a restaurant overlooking the bay - my Feijoada (kind of bean and beef stew) was the size of my head! Unfortunately the next day the heavens opened but we did spend some quality time in a Cuban cafe downing Cappuchinos - which came as a bit of a surprise as I wasn´t aware I liked them! In the end we didn´t get to see as much of beach life there as we had hoped but we did end up really falling for the place and I´d definately recommend it to anyone on their way up the coast! 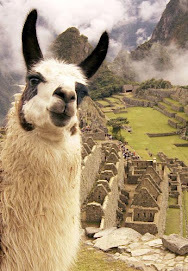 Well done on doing the Inca Trail -saw it on Vicci's blog. Just wanted to wish you both an amazing 2009 and to say that it's lovely to read about your travels when I get the chance.